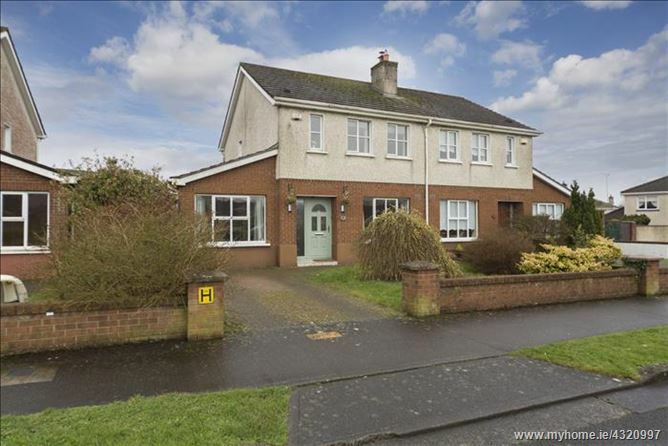 Spacious well maintained 3/4 bed semidetached house located in the popular Ardleigh development, just off the C link road and within easy access to Mullingar town centre with its large selection of amenities both social and essential at your fingertips. The house has been recently renovated to a very high standard. The ground floor accommodation comprises of entrance hallway with laminate flooring leading to the sitting room with feature integrated stove and laminate flooring. Double doors lead to the kitchen/dining area. The impressively fitted kitchen comes with wall and floor units, all appliances, tiled floor and wooden flooring in dining area, with patio doors to the rear garden. The utility room comes tiled and a large storage with laminate flooring and guest wc. The ground floor is completed with a second living room that would serve as an extra bedroom and has timber flooring. The first floor contains landing leading to the three bedrooms with the master being en-suite, and all have carpet flooring. The main family bathroom contains a three-piece suite with tiled floor, electric shower and wall tiling. The gardens are well maintained to the front and rear. The front drive is concrete and provides ample parking space. Laminate floor and storage under stairs. Laminate flooring, integrated stove which heats the room, TV and internet points. Tiled floor, impressive integrated appliances with cooker/hob, dishwasher, fridge/freezer, overlooking rear garden. Tiled Floor and zoned heating switch. Tiled floor, Toilet and sink. Solid timber floor and overlooking front garden.